10 May 2015: We were sad to learn this evening that recently awarded Arts Foundation of New Zealand Icon Award recipient, Jack Body, has passed away. Jack was a much loved composer and collaborator with a prolific career. He will be sorely missed by the arts world in New Zealand and his colleagues all over the globe. The Arts Foundation sends our condolences to Jack's friends and family and especially his loving partner Yono. Jack was a true pioneer at the centre of the arts in New Zealand. To know him was to love him. The following news items relates to Jack's Icon Award, presented to him on Tuesday 7 May in a private ceremony at Mary Potter Hospice in Newtown. 7 May 2015: It is with great pride that we announce that Jack Body , composer and Arts Foundation Laureate, has been selected as a recipient of the Arts Foundation of New Zealand Icon Award - Whakamana Hiranga. Limited to a living circle of twenty, Icons are artists whose work represents a legacy to our nation. They have made a significant impact on their chosen art form and continue to inspire others. Icons are world-class. Jack Body is a prolific world-class composer with global reach. The impact of his artistic life on New Zealand is profound. Jack has given so much to audiences, local and international composers, musicians and students. The Arts Foundation is honoured that Jack has accepted the Award and proud to have him as the first composer to be named an Icon, and the first Laureate to also receive an Icon Award. Jack was selected with two other artists to be awarded Icons this year. As Jack is unwell, a private ceremony was held at the Mary Potter Hospice in Newtown on Tuesday. Gaylene Preston, a fellow Laureate, filmmaker, and Chair of the Arts Foundation Governors spoke at the ceremony and a tribute to Jack was read by former Governor and fellow Laureate, Dame Gillian Whitehead . An open letter to Jack from Gillian is available to read further down in this news item. Extracts of this letter were included in her tribute on Tuesday. Each Icon Award recipient receives a medallion and a pin crafted by John Edgar. 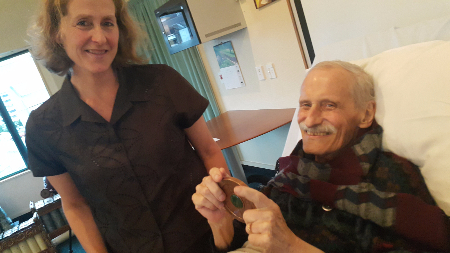 The medallion is returned to the Arts Foundation at the end of an Icon's life to be presented to a future recipient. Jack Body received the medallion from one of the inaugural Icons, Ralph Hotere . Ralph Hotere is considered one of New Zealand's greatest ever visual artists. Jack collaborated with Ralph many years ago on a series of works called 'Song Cycle.' Mary McFarlane, Ralph Hotere's wife at the time of his death, presented Jack with his Icon Medallion at the private ceremony this week with some moving words about Ralph's respect for Jack. Included further down in this news item is an open letter to Jack by Dame Gillian Whitehead, as well as heartfelt statements from the New Zealand School of Music, New Zealand Symphony Orchestra, Chamber Music New Zealand, New Zealand Festival, SOUNZ, and the New Zealand String Quartet. I'm so pleased you've been made an Icon of the Arts Foundation - the first composer to be so recognised - and if anyone deserves such an award, it's you. You have all the attributes of an Icon, and more - a significant body of work of outstanding quality (tick), a major contribution to the artistic and cultural life of New Zealand (tick), an international reputation (many ticks), and so on, and so on. But it's bittersweet to learn of it on the day I also heard that you are stopping chemotherapy, and won't be with us for much longer. Wellington will be a sorry place without your presence, energising, guiding, cajoling. I wonder how many people in New Zealand are aware of the extent of your involvement in the New Zealand and international community? You're best known as a composer, of course, as you should be. Your output has been so varied, and highly original as well as idiosyncratic, ranging from the major works - the wonderful and challenging opera Alley, and the extravagant Songs and Dances of Desire: in Memoriam Carmen Rupe, through a variety of orchestral, chamber and solo pieces. And also the electroacoustic pieces - those exciting early pieces that draw on the music of Java, like Musik Dari Jalan (which won first prize at the prestigious Bourges International Festival back in 1976) and the recent movingly simple intimate Histories (one of which picked up a Bourges award again 32 years later). Then there's the film music (Vincent Ward's Vigil and Rain of the Children), the photography and the sound installations, the theme music for Close to Home, music for dance, visionary collaborations with a huge range of musicians and performers, often conceived against considerable odds. One such was Passio, a visionary piece which recontextualised the first ever setting of St Matthew's Passion (by the 15th century English composer Richard Davy), with the Tudor Consort singing the Davy original, and instrumental commentaries devised by six composers associated with the Victoria University School of Music played by the Royal New Zealand Air Force Band. Performed in the highly resonant Great Hall of the former Dominion Museum in Buckle Street, the audience was able to walk at will around the performance space, and delight in the sound. But, although it could and should have travelled the country and beyond - a true Festival piece - there was just the one mesmerising performance. You've spent so much time in Asian countries since the 1970s, particularly Indonesia and China, undertaking pioneering field work for which you are lauded by the international ethnomusicological community. A born teacher, at Victoria University School of Music you opened the ears of students, colleagues and audiences to the sounds of Asia. There would not be such a strong gamelan culture here without you, nor the Asia Pacific and Gamelan festivals, nor the dozens of visiting musicians you involved in enriching the musical fabric of Wellington. And that's not to mention the steady stream of scores by a wide range of established and emerging New Zealand composers you produced as Editor of Wai-te-ata Music Press - an invaluable resource - nor the nearly 50 CDs, mainly of music by New Zealand or Asian composers, or, like South of the Clouds, of high ethnomusicological significance. And then there's your ordinary life, teaching, enjoying your garden in Durham Street with your beloved and loving Yono, and dispensing hospitality to frequent house-guests. We've known each other for 45 years, since we met in Venice as emerging composers in our twenties. Somehow, we didn't quite connect at the University of Auckland, where the teaching of Ron Tremain was a profound influence on us both - you began there the year I left for Wellington. After Venice in 1970, our paths crossed often. To your mind, everything in a project seemed simple, but in practice never actually was. But usually somehow it came through triumphantly, because of the regard and respect the musicians had for you. I remember when you were recording my Missa Brevis for a CD. You had found a wonderfully resonant space - the rock-climbing room at Victoria University, and the a Capella group Sings Harry were performing. And it was midwinter and bitterly cold. There was a one bar heater and everyone was huddled round it, wearing coats, scarves and gloves, then would move into position for a take, then back to the heater. A bemused rock climber came in and scuttled around the wall for a bit, but soon left. And at the end of the day we had a fine performance - soaring, tranquil and warm. Just one other example. You'd become interested in the music and recent history of Cambodia, and with considerable difficulty set up a collaboration between two New Zealand and two Cambodian composers, a group of players of traditional Cambodian instruments and the splendid NZTrio, to create pieces reflecting the devastating Pol Pot times. So you and I travelled to Cambodia, buzzed round Phnom Penh three of us on a moto, heard a number of distinguished performers and settled on the small group of outstanding and musically flexible performers who now make up the Tray So ensemble. The highlight for me was the day we travelled into the country, to hear the master of the kse diev, an ancient single-string instrument depicted at Angkhor. An elderly man, obviously a master, sat on a low platform in front of his house, with trucks and cars roaring past, playing this incredibly quiet instrument, apparently very difficult to play. A half gourd is held against the chest, which acts as a resonating chamber, and the kse diev is plucked, producing a delicate sound with intermittent harmonics. And in your piece, written subsequently, you replicated the sounds of this instrument in the sounds of violin and cello, suggesting the fragility and vulnerability of both the instrument and of human life. Another visit to Cambodia to rehearse the performers before they came to New Zealand for several performances, including the Auckland Festival and WOMAD, then recently, when sadly you were unable to come with us, a tour to Phnom Penh and five Chinese cities. What became most important was that the younger generations were hungry to hear the stories that the older generations, because they had lived through it, were unwilling to tell, and the student audiences were profoundly moved by the performances. They had not experienced their stories before. So what is your legacy? A lasting influence on students and performers whose ears and minds you have opened to new sounds, new ideas. A treasure trove of publications, recordings. You have fostered so many friendships and collaborations between New Zealanders and others across the world, which will expand and spread. And memories for us all of conviviality, food, wine, music and always enthusiastic plans for new and visionary projects. Thank you, Jack, for your gift of building and sharing friendships, your passion, your integrity, your taking New Zealand to the world and bringing such fascinating aspects of the world back home to us. You are a true and indispensable Icon for us all. We asked our friends at the New Zealand School of Music, New Zealand Symphony Orchestra, Chamber Music New Zealand, New Zealand Festival, SOUNZ, and the New Zealand String Quartet to supply us with some words with regard to the award.. They were all thrilled that Jack Body had been selected. "This Icon Award is the ultimate accolade, recognising Jack Body's extraordinary contribution to the Arts in New Zealand. Based at Victoria University since 1980, his prolific creative output has challenged and inspired us and music-lovers around the world for several generations. Jack's fearless originality and entrepreneurial acumen have helped to establish a new musical paradigm in this country as part of the Asia-Pacific." Director Te Kōkī New Zealand School of Music, Victoria University. "Jack Body is a great New Zealand artist and musical entrepreneur. He has made a unique and indelible contribution to New Zealand's cultural and artistic development. The New Zealand Symphony Orchestra has enjoyed an extensive and rewarding relationship with Jack performing, commissioning, and recording his works and implementing his initiatives to promote and perform new and New Zealand music for more than forty years. Jack's orchestral work Twenty-Three Pages composed to celebrate the 25th anniversary of the NZBC Symphony Orchestra marked his premiere performance with the Orchestra in 1971. Since then, the NZSO has performed numerous works including Melodies for Orchestra, Little Elegies, the 2002 NZSO commission Carmen Dances and a selection of arias from his opera Alley in 2010. Most recently, the Orchestra recorded the highly anticipated CD Songs of Death and Desire, to be released later this year. The NZSO congratulates Jack Body, one of New Zealand's most significant and vibrant composers, as a recipient of this prestigious Arts Foundation Icon award." "Jack Body has been a central figure in New Zealand music for decades. He has a long list of compositions that show genuine brilliance and they always reveal a distinctive voice. Quite apart from Jack's pre-eminence as a composer, he has an outstanding record of using his entrepreneurial flair to assist and promote the work of other New Zealand composers. Sonic Circuses, Asia-Pacific Festivals, Waiteata Press Music Editions and countless other projects are testimony to his dedication to encouraging a flourishing culture of new music in Aotearoa. At Chamber Music New Zealand we are always excited to work with Jack and enjoy his unique capacity to stretch and take chamber music as a genre in new directions. We are delighted he has been given the Arts Foundation Icon Award this year, recognition that is wholly deserved." "The New Zealand Festival has enjoyed close ties with Jack Body for many years. Jack's opera Alley, based on remarkable New Zealander Rewi Alley's life in China, was a highlight for audiences when it premiered at the 1998 New Zealand International Festival of the Arts. The Festival has especially welcomed Jack's ongoing commitment to exploring a musical discourse between Aotearoa and Asia. Recently Jack curated a unique collaboration between Chinese and New Zealand composers, Tales from the Forbidden City, which was very warmly received when it was presented at the 2014 New Zealand Festival, and also in Beijing. Performed by the New Zealand String Quartet and the Forbidden City Chamber Orchestra, it was a pioneering dialogue between two musical traditions. In 2004 the Festival honoured Jack with a special "Composer Portrait" concert, where four of his compositions were played. We're delighted that Jack is receiving a much deserved Arts Foundation Icon award this year." "The board and staff of SOUNZ are delighted that Jack has received an Icon Award from the Arts Foundation - the first Arts Laureate to achieve this honour. Jack has indeed left an indelible mark on the history of music in New Zealand. He has created and contributed a unique and world-class musical legacy that is testament to his love for humanity in all its diversity. Over his long career he has worked tirelessly to create opportunities for New Zealand composers to showcase their work, and to collaborate with artists of other cultures, backgrounds and genres. Jack studied and worked with Douglas Lilburn and in this centenary year has been a strong advocate for the work of all the composers of that generation. In taking their vision forward, Jack continues to challenge today's composers to question, explore and develop a musical voice for Aotearoa/New Zealand." "Knowing Jack and his work over more than a quarter of a century has enriched our lives enormously. He has masterminded numerous significant cultural exchanges over the years with boundless energy and enthusiasm for the many projects he typically had on the go at the same time. Whenever the phone rang and the cheery voice on the other end said "This is Jack!" in that inimitable tone, we knew something was afoot! Never just your average project, either. A new piece with string quartet and gamelan, or a huge Asian music festival put together on the smell of an oily rag, or a CD project ("could you record next week/next month? "), or an entire tour of some exotic locale. Ever generous to his colleagues, he often wanted to point us in the direction of some young NZ composer who he thought was something special, or a visiting composer from another country whose works he thought we'd be interested in. He also has a huge appreciation for folk music from cultures around the world and his folk music transcriptions are audience favourites wherever we play them, both at home and abroad. Jack has built so many bridges between musicians of differing backgrounds and cultures - the connections and new artworks thus forged will be a lasting legacy, along with his own rich output. While we were together in Beijing presenting works by NZ and Chinese composers especially written for the NZSQ and the Forbidden City Chamber Orchestra, it was clear that Jack has hero status there and we're sure the same is true in other parts of Asia. The last piece he wrote for us "Cries from Border Towns," for quartet and six voices, was commissioned from him in 2013 but he reluctantly turned it down due to ill health and lack of energy. Then, months later, Helene went to his house with a cake for his 70th birthday and he announced he was going to write it after all. A birthday present for us! A few weeks later it was finished - a wonderful and very moving work. Jack's music is full of interesting uncluttered textures, gorgeous sonic worlds, space and grace. His free spirit, fresh childlike enthusiasm, sparkling imagination and the passion which he brings to all his musical adventures has inspired us immeasurably as musicians and people. His contribution to NZ music will live on for many decades to come and we are thrilled that he has been recognised with an Arts Foundation Icon Award."